Kinesiology-kinesitherapy is a therapeutic treatment based on the principle of muscle rebalancing, with your active participation during your treatment. Treatment is always based on an essential rule: lack of pain. Your active participation is also essential because your kinesiologist-kinesitherapist can give you tips and simple, personalized exercises to extend the benefits of treatments in your home or during your social, professional or sports activities. By being an active participant in your treatment, you reduce the time and costs of the sessions. A large number of medically diagnosed pathologies and musculoskeletal problems, including chronic pain, respond significantly to this type of treatment. WOULD YOU LIKE TO MAKE AN APPOINTMENT WITH ONE OF OUR KINESIOLOGIST-kinesitherapist? CONTACT US AT 450 266-1333. 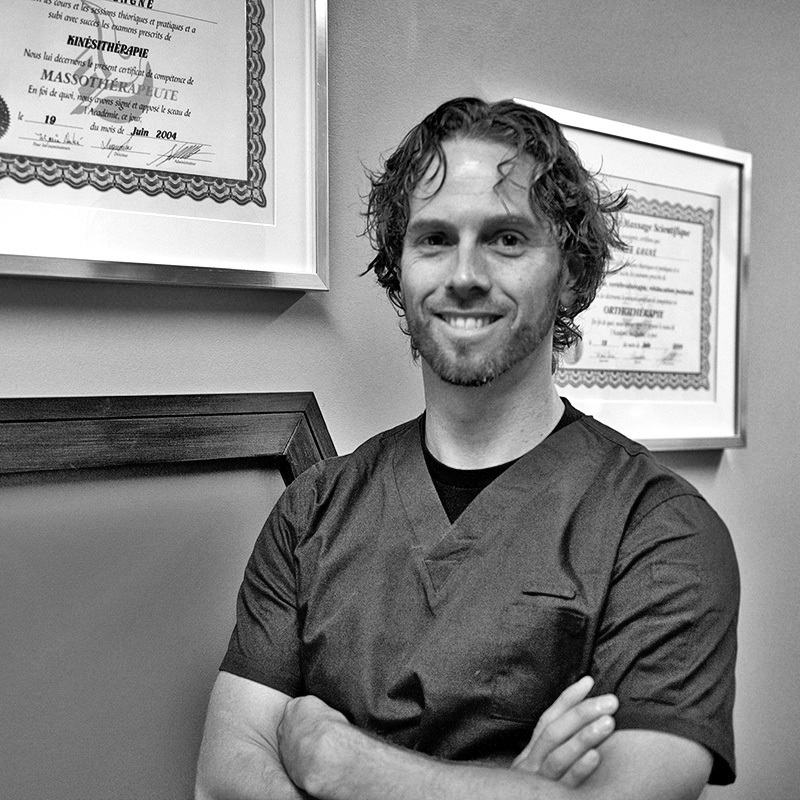 SIMON GAGNÉ OFFERS YOU ORTHOTHERAPY, MASSOTHERAPY AND kinesitherapy SERVICES ON SITE AT ÉNERGIE SUD. IT IS IMPORTANT TO HAVE AN ASSESSMENT AND A CUSTOMIZED ACTION PLAN THAT FITS YOUR ASPIRATIONS, PERFORMED BY A PROFESSIONAL (KINESIOLOGIST, kinesitherapist, OR OSTEOPATH, ACCORDING TO YOUR PROFILE). Only about 30 coaches in Quebec, including three of ours, have this training and the associated licence. Take advantage of their special expertise. They are thus able to recognize certain health conditions and can recommend new lifestyle habits, diet changes, and proper supplements. Kinexpertise coaches can therefore identify which of your systems is the most disrupted, determine which protocol is right for you, and target specific actions that can garner quick results. They can support you by recommending dietary changes, lifestyle changes, and necessary supplements. We have the InBody technology that allows multi-zone segmental analysis. The result is a detailed and accurate report of your physiological condition, including percentage of body fat, lean body mass, and water retention. This allows you to know the exact amounts of muscle mass, fat mass, and intracellular and extracellular water that your body contains. Whereas traditional body-composition analyzers rely heavily on statistical data (age, gender, type), the InBody impedance meter performs real measurements on your body. It is therefore more reliable and precise; currently there is nothing else like it on the market. With regular use of Inbody, you’ll see the actual impact of each training program on your body composition by analyzing the results. You can then adjust your workout according to your starting goals. InBody multi-frequency direct segmental analysis has been approved by numerous clinical studies and in scientific studies.